First Saturday of every month UPDATE: First Thursday of each month, at 10pm, EN Japanese Brasserie hosts a dinner inspired by their staff. The idea is to not let anything go to waste. The chef uses left over ingredients like fish heads, eel bones, vegetables and scraps of wagyu beef and whips up a creative late night meal for themselves, traditionally called Makanai. EN brings this concept to diners, a rare and unique treat for food lovers and late night munchers. 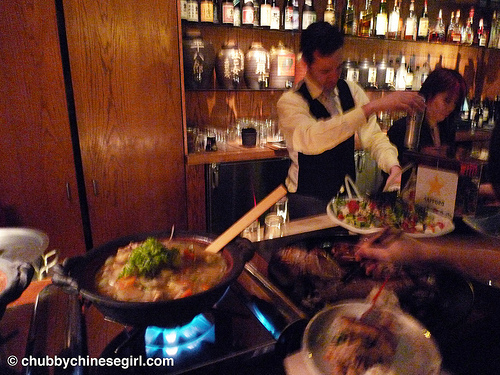 Dishes change seasonally, below was our fun and yummy $45 experience (food + beer). This was a casual affair… really really casual, we almost felt like we worked there or something. 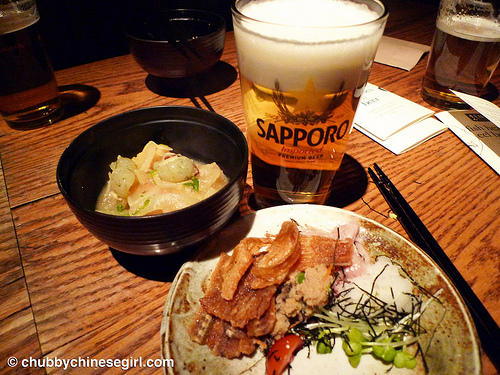 First claim your seat, then go over and hand the bartender your glass for unlimited Sapporo beer throughout the meal. Then it’s all self serve, free for all. At first we felt like there wasn’t enough food, but then they kept bringing out more and our tummies were fully satisfied and happy. 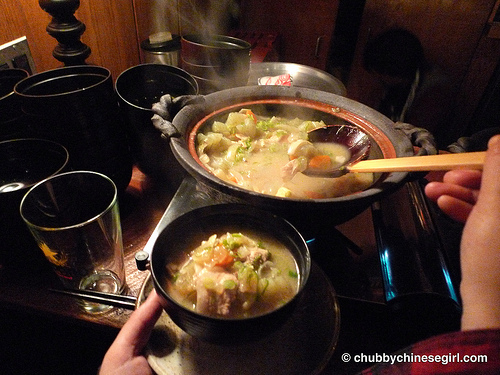 The Butajiru, a hearty pork and vegetable miso soup started off the evening right. Tender pork, simmered daikon radish, carrots, cabbage, onions and my favorite konjac, this gelatin ingredient found in japanese soups. It doesn’t have much taste, but I like the texture, a cross between jelly and mochi. I heard it’s good for you, how and why I don’t know, but I dig it. Here’s my first round. I don’t usually drink beer, but this was the perfect compliment to everything on my plate. Not the best stuff to be eating so late at night, but I’m up for a calorie splurge once in a while. There was some mushy tuna concoction that wasn’t my thing, you can see that beige thing in the middle of my plate. Mushy fish isn’t this Chubby’s idea of something yummy. And the tomato and tofu salad was prettier to look at. 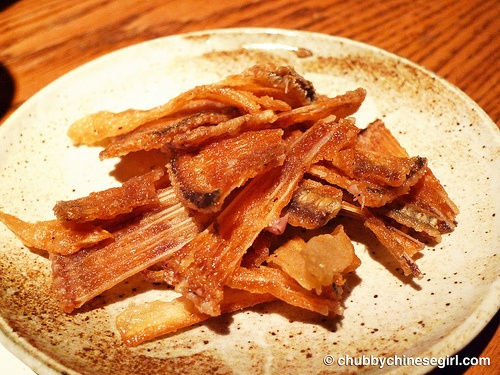 Star of the night for me were these helplessly addictive Deep Fried Eel Bones and Fluke Bones. 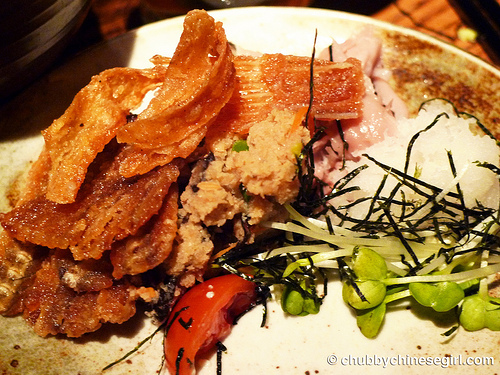 Crisp, crunch and full of umami. A couple of these and a couple sip of icy cold beer… ahhhhhhh yes, let all the day’s hard work melt away… ok wait, it’s saturday, but you get the picture right?. 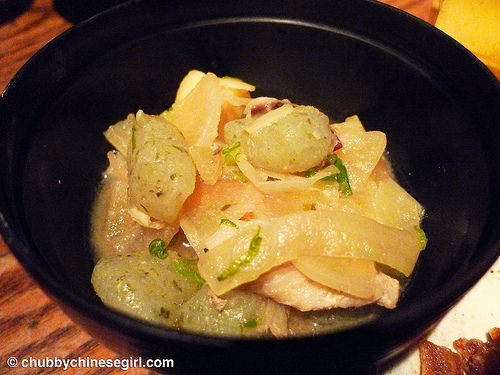 I was transported to a little kitchen in japan and eating amongst some imaginary chefs for awhile there, how do you say “me like” in japanese? I’ve never had self serve Chirashi, but I wasn’t complaining. The fish was perfectly fresh and the rice just right, not too sticky, or sour. This version is more like sashimi ends over vinegar rice, not as fancy schmancy as my usual bowl, but tasty nevertheless. Sake marinated whole roasted tuna collar was decadent. 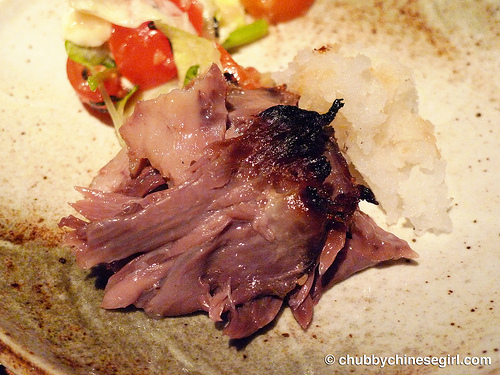 The meat is so tender, smooth and delicate. It would totally be a shame to waste it. Fatty enough, but not overpowering. The parts with a little bit of chard skin were best. For some reason, I really love the texture (sort of like a cross between ginseng and bamboo shoots) of Burdock. The root vegetable has amazing health benefits and I love it prepared this way, Burdock braised with soy sauce, sugar and mirin. Sweet and herb like, slight crunch as it soaked up all the sauce. Here we are, the usual “adventurous” suspects. J & C are real troopers, who’ve attended random events with me, just because I promised it would be fun and yummy. They’ve totally trusted me and my picks. A lot of my post were possible because they were willing to come along for the tasty ride. I mean, not everyone would jump on the wagon to pay $45 for kitchen left overs and things like head and bones, but they enthusiastically said yes! No questions asked and starved with me until 10pm on a Saturday night! 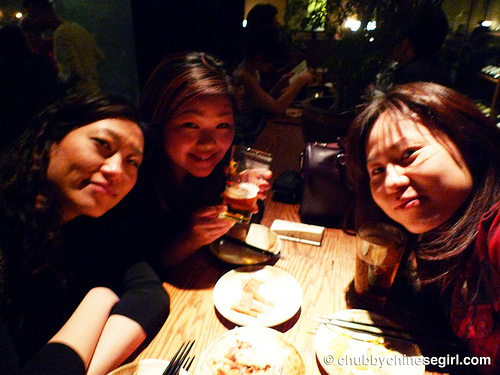 People say life is better with company, I would add that life is surely better with great company plus fish head, eel bones and beer. Overall we had a lot of fun and great late night eating. Would I go back and do it again, probably not, but if you’ve never done it, I would highly suggest trying it at least once. 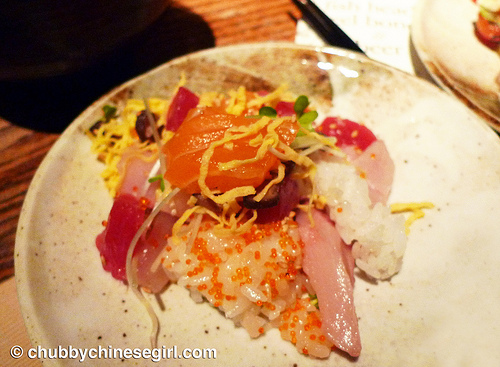 Even if you don’t go for this event, regular menu at EN is always amazing and the reason I keep going back, from homemade tofu, to uni squid, my favorite miso cod in the city and beef or fish tataki. CALL IN ADVANCE TO MAKE RESERVATIONS! Yeah i think if I could change anything, maybe dust the fried bones with some seaweed, but they were great anyways!! 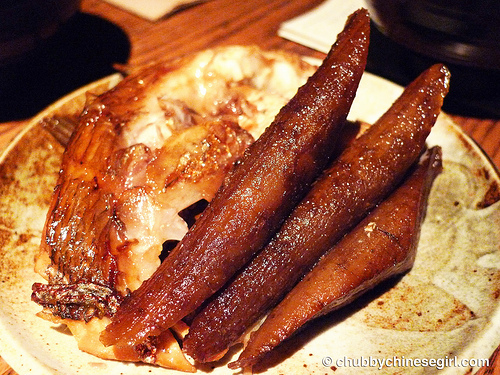 Oh that was fish collar, super meaty and tender! sooo good!